Community Food Initiatives North East (CFINE) said people in the region are still in poverty as a result of the oil price crash which first struck four years ago. The social enterprise and charity, which runs a community foodbank, expects to hand out more than 20,000 food parcels this year. Chief executive Dave Simmers said: “We know that there are people who are casualties of the oil downturn still coming in. “It’s not a surprise. We know that many people are living beyond their means. “What the oil downturn hit home for me was how many people are just one or two payslips away from the whole house of cards falling down. The rollout of the Universal Credit welfare system has also been blamed for the pressure on the charity. As well as food parcels, CFINE offers financial support services to help people get their full entitlement to benefits. Universal Credit, a government scheme amalgamating several forms of welfare benefits, came into force in the area in October and has led to more people using the foodbank, as well as financial counselling. Mr Simmers added: “Poverty has dramatically increased in Aberdeen over these past years. People who have lost their job in the oil industry are going into the benefit system. Mr Simmers conceded there are fewer people using their services now as a direct result of the oil price slump than in recent years. 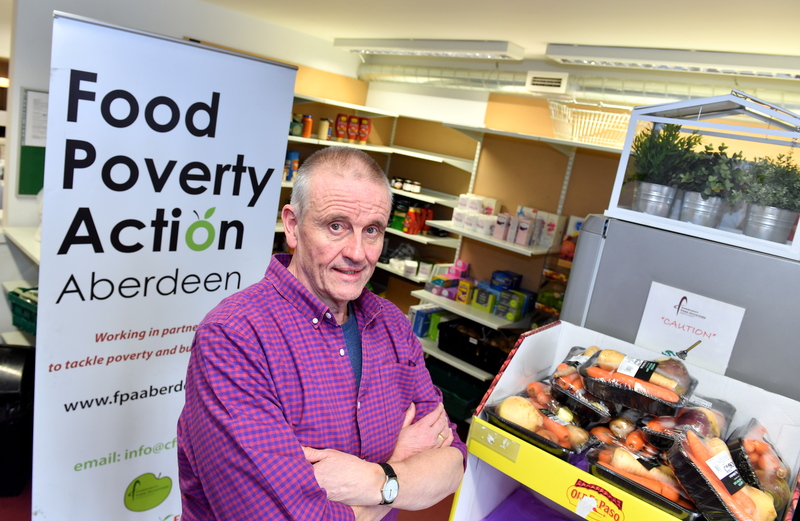 He added that he now doesn’t need to spend as much time working to prove the levels of poverty in Aberdeen, which has historically been viewed as an affluent region. However, CFINE has also seen a key source of revenue drop since the downturn, with fewer firms buying produce. The group uses its profits from selling fruit and vegetables for reinvestment in other initiatives, such as training volunteers, supporting the foodbank and tackling period poverty. Since the oil downturn, the number of energy firms buying healthy produce has dropped dramatically, and has equated to a loss of £150,000 annually in revenues. Mr Simmers added: “Our food stocks are under constant pressure just now. We have a lot of companies doing food drives for us but come Christmas it is always a real concern as demand increases. The foodbank is currently seeking non-perishable goods to stock its shelves for the busy Christmas period. More information on how to donate can be found on the CFINE website.